Project slices—condensed project-based learning for teachers—give educators a student’s perspective on what it’s like to do a project. You’ll also build trust with your students as they see that you as an adult are a partner in the learning, not simply an adult giving them a task. You can share your learning with your students and give them feedback, hints, and warnings. All in all, doing a project we ask of students has a lot of payoffs. But we’re all very busy, so how are we supposed to find the time to complete a project that can take 10 hours or more? A project slice is exactly what it sounds like. If a full PBL project is a pizza, a project slice is a sliver of it. It contains all the elements of the full project, but in a shorter form. Project slices can take one day or might be extended a bit longer depending on time available. The project doesn’t have to be one teachers plan to do in the classroom. We know the value of PBL for professional development. Teachers work together on an authentic challenge to become true learners, exploring a driving question and participating in a launch, receiving instruction and feedback to support learning, and sharing their work and learning publicly. This helps teachers reflect on the experience of PBL, see challenges students will face, and create engagement and excitement for doing PBL in the classroom. Many schools and organizations have done project slices. 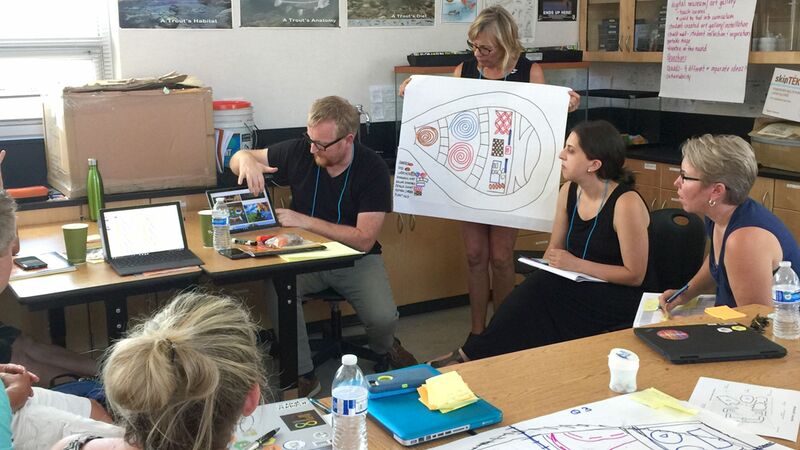 I participated in facilitating a project slice for teachers at PBL World in which they reimagined a school courtyard to focus on a global goal. A group of teachers at High Tech High engaged in a week-long project slice around the question: “What is our responsibility to our global neighbors?” And a principal I know designed a project slice to have teachers solve the issues of parking as well as parents picking up and dropping off students at her school. What is the authentic challenge? The project slice should be focused on something real and relevant. Consider local issues, perhaps school- or community-related. These don’t have to be huge issues like climate change or food scarcity; options include a school challenge or a local connection to a larger national or global issue. What are the content and skills to be learned? The project should not only be authentic and meaningful but connected to clear outcomes. Pick standards and corresponding success skills, like presentation and collaboration, to give learners clear guidelines for success. While it might seem silly to have teachers do a project aligned to seventh-grade math and English language arts standards, doing so allows them to experience a project with a clear connection to content and skills and how they might be assessed. What is the launch? All PBL experiences have something to launch the inquiry and solicit learner questions. Consider using a piece of correspondence, a video, or even a guest speaker to launch the project slice. Who is the audience? It’s always challenging to get audience members for student presentations and work. Recruit parents, community members, and students long before the project slice occurs. Make the sharing of public work as real as possible. How long will the slice be, and when will it occur? It’s most likely easiest to make this happen on a designated professional development day if you already have that in your calendar. A slice can also be a volunteer option during the school year, with the use of substitute or guest teachers. How will direct instruction and other scaffolds be used in the slice? It’s really powerful when teachers experience direct instruction in a slice, as they see how it can fit into a project. Scaffolding activities like readings, research, jigsaws, and the like can support the learners in the project slice and model a variety of instructional strategies. How will participants get feedback and reflect? Plan reflection along the way to mirror this critical component of a student project. Reflection can take the form of journals, table talks, and quick writes. And have participants give each other feedback to model critique. While it is critical to reflect on the implications of teaching through PBL as you engage in a project slice, it’s also important to pay attention to being a learner. There can be moments when we step out of the project slice experience to think about implementation as a teacher, but it’s extremely powerful to commit to being a learner and reflect on that experience. Use the reflective moments planned inside the project slice to reflect on how it felt to be a learner. What challenged you? What was exciting? What did you learn? What do you want to learn next?